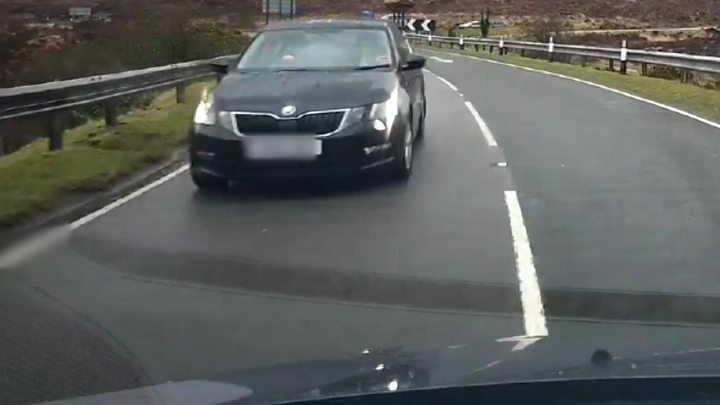 Dashcam footage has emerged of drivers narrowly avoiding head-on crashes with cars being driven on the wrong side of roads in the Highlands. The videos have been uploaded to social media amid a local campaign to remind tourists to drive on the left. Sharon Anslow set up the Keep Left campaign after she was injured in a crash with a tourist's car in Skye in December last year. Police Scotland and MSP Kate Forbes are backing Ms Anslow's safety drive. The dashcam footage, believed to show tourists from overseas, was taken by drivers as they drove on Highland roads in day-time and in darkness. In the videos, cars can be seen coming head-on on the wrong side of the road, including at a corner in the dark. Ms Anslow said she tried to avoid a car on the wrong side of the road while she drove to work in Portree on 29 December. Her car was pushed into a ditch by the side of the road. She was freed from the wreckage by firefighters and suffered bruising and a sprained ankle in the crash. The other driver involved received a fixed penalty notice following the accident. Ms Anslow drives past the scene of her accident almost every day. She told BBC Scotland: "It's terrifying. I relive the moment all the time and try to figure out if I could have done anything differently, but I couldn't have done." After the accident, other people told her of similar incidents, leading to her setting up the Keep Left campaign to improve safety on roads across the Highlands. Ms Anslow said: "So many people contacted me after my accident saying: 'It happened to us'. Even earlier that day of my accident it had happened to somebody else. She said the campaign was not about "knocking tourism" in the Highlands, but trying to make the roads safer for everyone - both visitors and residents. and for hire car companies to place "keep left" stickers inside their vehicles. Local police, councillors and MSP Ms Forbes have been working on the campaign. Portree-based Sgt Bruce Crawford, of Police Scotland, said given the large numbers of visitors attracted to Skye and the wider Highlands area the number of accidents was low. But he said some of the accidents that did occur were serious. Sgt Crawford said: "Quite often these collisions are caused by inattention, people who are probably spending time looking at the scenery as opposed to paying attention to the road. "We want to urge people to take that bit more time looking at the landscape while the car is stopped, and then getting back into the car driving mode when they have got back into the car and back on the road." Ms Forbes, SNP MSP for Skye, Lochaber and Badenoch, has called on Highland Council, Transport Scotland and VisitScotland to help in the effort to improve road safety. She said: "As a frequent driver in the Highlands, footage of cars driving on the wrong side of the road is a matter of concern. "There are no easy fixes and that's why I've taken a number actions since the Keep Left campaign was launched." She added: "There is a need for additional signage and road lines, so long as it does not clutter the road and risk additional distractions. "Highland Council committed to doing that before the tourist season and Transport Scotland have agreed to meet me in the Highlands at the peak of the season." Highland Council said improved road markings were to be added to 18 miles (28km) of its roads, including Skye's A863 Sligachan-Dunvegan, A850 Borve- Dunvegan and A855 Portree road.